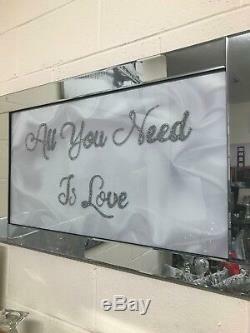 All you need is love picture in mirrored frame Ref: PH-all. 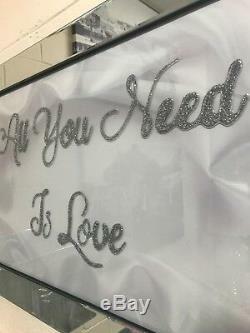 Beautiful All you need is love picture which has sparkly glitter on the glass to really make the image stand out. 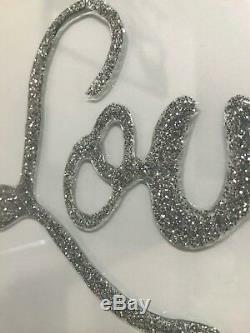 Its held in a lovely beveled mirrored frame. This picture requires hanging with wall hooks (the frame makes it to heavy to be hung with string). We will advise of return carriage charge. Because we understand you want the best quality delivered to your door at the best possible price but still deal with a company who you can speak to. We keep things simple we deliver what we promise. And thats to get your item to you in the fastest but safest way, We go the extra length of re-packaging many items so they are 100% when they reach you, again at no extra cost. 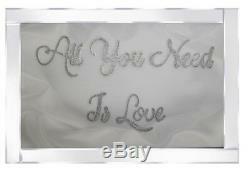 The item "All you need is love sparkle glitz mirrored picture, glitter art wall picture" is in sale since Thursday, January 25, 2018. This item is in the category "Home, Furniture & DIY\Home Decor\Wall Hangings". The seller is "modern-furniture-and-lighting" and is located in Morpeth. This item can be shipped to United Kingdom.